Cocaine addiction is a serious issue that may cause short-term & long-term ad verse, even irreversible effects on the body. 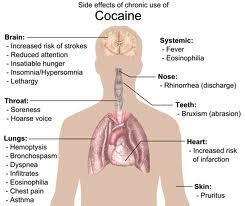 The Effects of Crack Cocaine Addiction can be felt by everyone, not only the user, but also the people around them. While the large majority of short-term effects don’t appear all that bad (who would not need more energy & mental clarity, with a job that requires long hours) but, due to the nature of the drug, these short-term effects only last as long as the high itself – they wear off quickly, making the user need to continue using repeatedly which can lead to addiction. As you can see, the short term & long term effects may cause permanent, irreversible, & deadly consequences on the body, making it imperative that those suffering from cocaine addictions get help immediately. The Effects of Cocaine Addiction Withdrawal can be even more extreme than the addiction itself, which means medical supervision may be necessary to make the change positive for you or for the you love to detox safely. Enrolling in a Cocaine Addiction Treatment & Rehabilitation Program could mean the difference between having a life worth living & feeling powerless to a drug, or even worse – life or death.